The Harvard mount of the giant pliosaur, Kronosaurus, alas, is mostly plaster. The skeleton was created at a time when just a few bits and pieces were known. Today, in 2014, we know of a dozen specimens. Thanks to a dissertation by McHenry (2009) and some recent discoveries, we can finally put the giant marine reptile back together again, the right way. For decades we’ve had this powerful torpedo-like image of Kronosaurus (Fig. 1). Sadly, it’s not quite right. Figure 1. Click to enlarge. The Harvard Museum of Comparative Zoology sculpture of Kronosaurus. Impressive, but a little too tubular, as subsequent discoveries have revealed. Since then a nearly complete specimen has been found for K. boyacensis (Fig. 2) in Columbia, far from the resting point of many other specimens in Australia. Figure 2. Kronosaurus boyacensis (Hampe 1992, Hampe and Leimkuhler 1996) in situ, from Columbia. 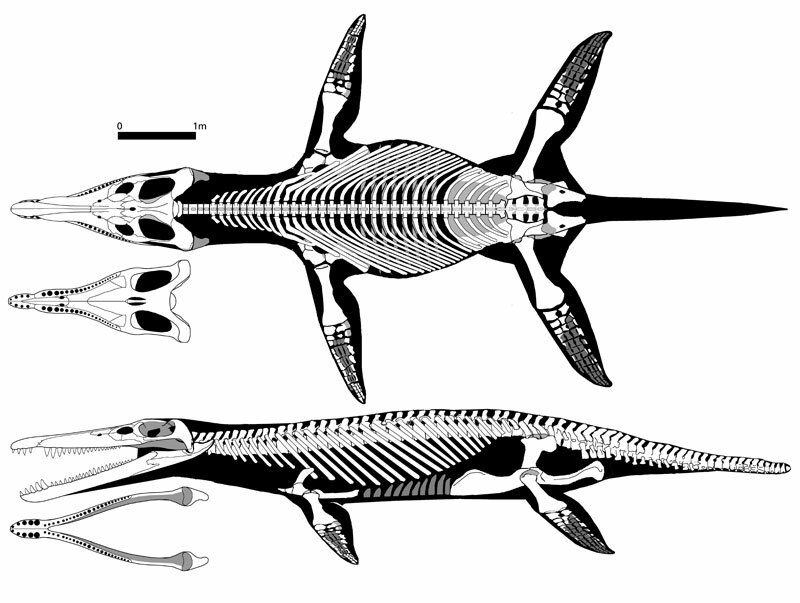 Kronosaurus (Longman 1924) is chiefly known from bits and pieces, but a few big skeletons are also known (Fig. 2). McHenry (2009) put the bits and pieces of the skull together, producing excellent restorations and reconstructions. These were used to create a new look for Kronosaurus (Fig. 3). Figure 3. Click to enlarge. Kronosaurus in several views. The ribcage is much wider than previously envisioned. The pectoral girdle may be larger, but if so, it is not exposed. The skull is traced from McHenry 2009. Note the rise in the mandible posterior to the jaw joint. This would have prevented overextension of the mandible as it opened, flooding with seawater pushing it even further open. The wide, round torso is more like that of slower-moving plesiosaurs, despite the attractiveness of the prior torpedo-like shape. The new, wider torso and longer neck of Kronosaurus is more like that of other plesiosaurs and pliosaurs, and not so torpedo-like, as in the Harvard mount. Very few images of Kronosaurus on Google Search reflect the new, more accurate look. But I was able to find this wonderfully accurate sculpture from a small town (ca. 550 citizens) in Australia with its own, life-size Kronosaurus (Fig. 4). Figure 4. Life size sculpture of Kronosaurus in the small outback town of Richmond, Australia. They got it right! A few last notes from the McHenry 2009 summary. “Based upon the analysis in this thesis, the fossilised remains of large pliosaurs from the Early Cretaceous marine sequence of the Great Artesian Basin represent a single genus of brachaucheniid pliosaur, Kronosaurus. Specimens from the Doncaster Formation and the Toolebuc Formation indicate the presence of this taxon in the Late Aptian and Late Albian epeiric seas respectively: some isolated teeth from the Griman Creek Formation may be referable to Kronosaurus and thus record its presence in the Early Albian Sea. Available evidence is consistent with the presence of a single species in the Late Albian, Kronosaurus queenslandicus Longman, 1924. The Late Aptian material is consistent with Kronosaurus queenslandicus, pending further study of the Colombian species Kronosaurus boyacensis Hampe 1992. Analysis of 11 specimens from the Late Aptian and Late Albian of Queensland indicates a size range from 4 to 10 metres in Total Length, and 1–10 tonnes in body mass. By the criterion of the degree of fusion of cranial elements in the rostrum and circum-orbital region, smaller individuals are interpreted as immature sub-adult animals. The dentition is markedly anisodont, with the largest teeth in the anterior part of the tooth row. Maximum basal skull length is 2.2 m, with a mandible length of 2.7 m. 35 pre Of large pliosaur taxa described to date, only Kronosaurus queenslandicus has four pairs of premaxillary teeth. The post-cranial skeleton is of a compact, fusiform body shape with a short (but flexible) neck and a short tail. Presacral vertebral count is 35, including 13 cervicals and 3 pectorals. The centra of the posterior pectorals/ anterior dorsal vertebrae have the largest diameter, with height exceeding width. Transverse processes are robust, suggesting robust ribs in the thoracic region. The femuri are longer and more robust than the humeri, and the pectoral limbs appear to have been of a lesser diameter than the pelvic. The distal limbs are hydrofoils with a high aspect ratio. Maximum total length is 10.5 metres, with a hind limb span of 5 metres and a body mass of ~11,000 kg. Comparative biomechanical analysis suggests that bite force was large: 15–22 kN for an anterior bite, and 27–38 kN for a posterior bite, depending on the modelling approach used. For its skull volume and its body size, bite force magnitude is comparable to that of modern crocodilians. Finite element analysis indicates that, compared with a 3.1 m small adult saltwater crocodile Crocodylus porosus, the rostrum of Kronosaurus was subject to higher strains during normal bites. Similarly, when subjected to torsional and laterally directed loads that simulate the twisting and shaking behaviours used by large extant Crocodylus to kill and process large prey, the skull of Kronosaurus carried more strain than that of C. porosus. Based on this result, maximum prey size, relative to body size, is considered to have been smaller in Kronosaurus than for a 3.1 m C. porosus, although the actual magnitude of this limit is unknown due to insufficient data on diet in C. porosus. The apparent discrepancy between the bite force result, which suggest comparable sized prey, and the finite element analysis may be due to hydrodyamic factors involved with rapid adduction of a >2 m mandible. Data from stomach contents confirms that Kronosaurus fed upon other reptiles and was able to process large animals into smaller pieces suitable for swallowing. Confirmed prey includes a small turtle, a small elasmosaur, a large elasmosaur, with a possible instance of a large shark. Biomechanical and functional considerations suggest that twist feeding may not have been employed to process large prey, but that the pronounced underbite in the rear half of the tooth row, coupled with large bite forces, may have allowed Kronosaurus to process prey through straightforward biting. There is also evidence of intra-specific aggression directed at a sub-adult, possibly by a larger animal. Non-biomechanical comparison with the functional morphology of various species of crocodilian and odontocete suggests that the elongate rostrum and flexible neck might have allowed Kronosaurus to take relatively smaller prey than can Crocodylus porosus. General patterns in the ecology of large marine amniotes suggest that a broad prey base was likely, perhaps ranging from a lower limit of 1 kg an upper limit of 3,000 kg. Potential prey were probably nektonic and demersal, and may have included teleosts, cephalopods, sharks, and reptiles. Ontogenetic shifts in diet most likely involved an increasing proportion in relatively large prey with age. Kronosaurus is therefore characterised as a dietary generalist, capable of taking large reptilian prey due to its own large size and robust dentition, but with much smaller reptiles, sharks, teleosts and cephalopods comprising most of its diet. A broad overview of the functional morphology of aquatic marine predators suggests that they operate under a pair of conflicting constraints of (1) selection for a skull morphology that allows efficient capture of small agile prey, which is predicted to be a longirostrine form, and (2) selection for a skull shape that resists the bending loads caused by biting large prey, which is predicted to be a high vaulted, brevirostral shape. A skull morphology that lies close to either one of these opposing ends of this morphological spectrum is interpreted as specialisation on small and large prey respectively. The playtrostral, mesorostral skull of extant carnivorous odontocetes and crocodilians is interpreted as a biological trade-off between these conflicting requirements. In Kronosaurus, a different pattern of trade-off is achieved involving (1) an elongate mesorostral to longirostral skull, (2) an array of caniniform teeth placed relatively far forward in the jaw, (3) a robust dorsal median ridge on the rostrum that acts as a dorsal compression member, and (4) a high bite force. This functional complex requires complex patterns of growth in the orbital and rostral regions of the skull that result in an osteology exhibiting pronounced ontogenetic variation. McHenry CR 2009. ‘Devourer of Gods’ – The palaeoecology of the Cretaceous pliosaur Kronosaurus queenslandicus. Ph.D. dissertation, University of Newcastle, 616 pp. online and download here. Hampe O 1992. Ein grosswuchsiger Pliosauridae (Reptilia: Plesiosauria) aus der Unterkreide (oberes Aptium) von Kolumbien Courier Forsch.-Inst. Senckenberg 145:1-32. Hampe O and Leimkuhler C 1996. Die Anwendung der Photogrammetrie in der Wirbeltierpalaontologie am Beispiel eines Kronosaurus-Fundes in Kolumbien. Mainzer geowissenschaftliche Mitteilungen 25:55-78. Longman HA 1924. A new gigantic marine reptile from the Queensland Cretaceous. Memoirs of the Queensland Museum 8:26-28. This entry was posted in plesiosaur, pliosaur, reptile family tree, sauropterygian and tagged plesiosaur, pliosaur, sauropterygian by davidpeters1954. Bookmark the permalink. Regarding the recent post on Kronosaurus: I am familiar with the Harvard “Plasterosaurus”, and the revisions to the overall body length. A few years ago I ran across a photo of what is supposed to be a Kronosaurus skull that bears no resemblance to either the Harvard or any other reconstruction. This photo can be seen at the top of the page devoted to Kronosaurus on the Oceans of Kansas website. The skull is large, appearing to be at least 3 meters long, but much deeper and massive than any other Pliosaur skull. The teeth on the premaxilla look to be close to 30 cm long. So, will the real Kronosaurus please wave a flipper. This picture shows a preparator (Arnie Lewis) working on the 9 foot long (2.7 m) skull of Kronosaurus queenslandicus at the Harvard Museum of Comparative Zoology. Note that this is the original “smooth” reconstruction of the back of the skull (circa 1957-58), lacking the parietal crest. Photograph published in the Natural History Magazine, 68:22-23 (January, 1959). That is the Museum of Comparative Zoology’s mount at Harvard, not Yale. Corrected! My mistake. Thank you.